Multiple firefighters have died in California during this fire season. NBC 7's Alex Presha reports. 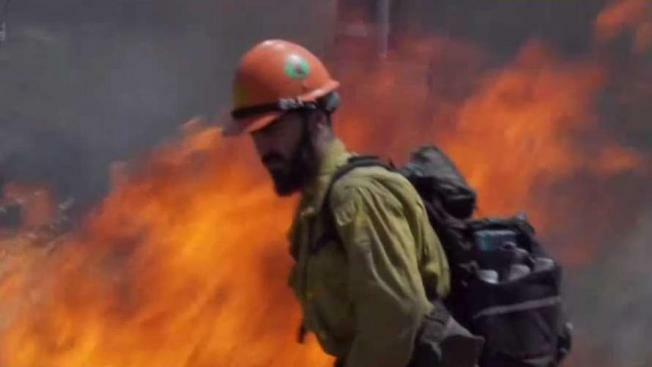 As flames and destruction grip the state, firefighters and their families are dealing with stress and emotional pain on a scale never seen before, veteran firefighters say. To help crews cope, departments are ramping up emotional assistance resources and urging fire crews to acknowledge the psychological pain their jobs can cause. At Cal Fire headquarters in El Cajon, flags fly at half-staff, as a tribute to six firefighters and equipment operators that have died in the line-of-duty in just the last four weeks. Cal Fire Capt. Isaac Sanchez and his colleagues have placed a thin strip of black fabric on their badges in another recognition of the sacrifice made by colleagues. Sanchez said his badge usually had the fabric shroud for about a week --- from the date of the firefighter’s death to his or her memorial service. “But we've been wearing them continuously since (heavy equipment operator Braden) Varney was killed up at the Ferguson fire,” Sanchez said. Since Varney’s July 14 death near Yosemite, at least five more firefighters and five civilians have died in fire-related incidents, Sanchez confirmed. The emotional toll of that loss and the physical exertion of the non-stop fire season are taking a toll on even the most seasoned fire crews. “It used to be that we’d have one or two disasters that we would respond to over an entire year,” Sanchez explained. “Now we're going from disaster to disaster. Some folks are on their fourth or fifth fire, where you know, real lives are being impacted, property is being impacted, and it's having a very serious effect on the community." Sanchez said the non-stop wildfires, which have burned more than 700,000 acres, definitely take a physical and emotional toll on fire crews. "It's not just the fatalities. It’s the non-stop work. It’s the constantly being assigned, and jumping from fire to fire. It’s the wear-and-tear on the family back home, and the consistent destruction that we're seeing," he said. Sanchez says good training, emotional support from colleagues, counseling for families, and work schedules that allow time to rest and recuperate, help firefighters cope with this season’s intense workload. There’s also a "critical incident stress management" program that gets professional mental health professionals to the crews quickly, for support and counseling. Battalion Chief David Picone of San Diego Fire-Rescue says open discussion about mental health helps his crews resist the urge to downplay on-the-job trauma. "They're starting to become more aware that talking about (feelings) is actually OK. That, you know, there’s nothing wrong with it," Picone said. Picone told NBC 7 his department has bulked up resources for mental health emergencies, more than tripling the number of chaplains assigned to battalions and adding more peer counselors and trained mental health professionals. San Diego Fire-Rescue also encourages veteran firefighters, lifeguards and paramedics to set an example for recruits. "When we have an issue and we've been on the job for a while, (it’s important for us) for us to be able to say, 'Hey, it's OK to talk’. It's OK to (admit) that 'I'm not OK.’"